The All Stars for 2013 has finished with the winners being Phil and Amity. A great job was done by all contestants, but we wanted to go back and do a review of the room that appeals to us the most here – The Exterior. The four gardens were very similar to start, all were effectively small courtyard gardens. All four block contestants did well to connect the house and garden. Very professional results were achieved, none of the exteriors looked like DIY gardens. This garden has some interesting elements to it. 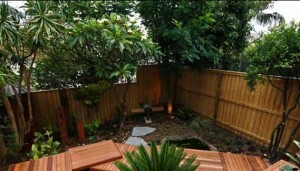 We really liked the idea of the decking pathway and the koi pond as a way of leading people down into the garden space. The decking pathway added a unique look to the garden. The established plantings really helped to add intrigue to the garden and create intimacy. We liked the up lighting to highlight the beautiful canopy. The large cycads and bromelaids were also great additions to the garden. 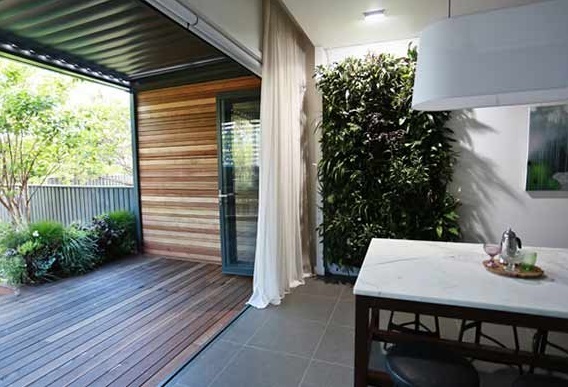 We would have liked to see a more usable seating area in the back corner to not only pull people down there, but ensure they stick around and connect with the space, but overall this was a nice garden. We really liked this garden, mainly because of the way it connected with the inside of the house, Josh and Jenna did a great job on creating a seamless flow from house to garden. The decking at floor level was the key here. It enables indoor-outdoor living year round, with the decking being under cover and the outdoor kitchen was a stroke of genius. We loved it! The plants were well selected and the plantings were nice and full giving an established look to the garden. We also loved that there was a small usable lawn area for kids. An excellent garden all round. Dan and Dani did a good job here with a limited budget, the space is a little sparse but still practical and functional. 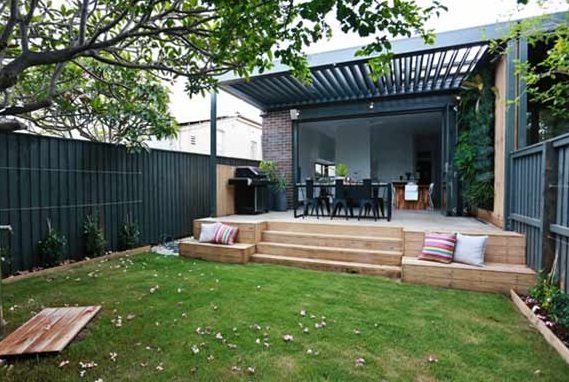 The lawn is a good space that would certainly appeal to families with small kids, especially with the indoor living space looking out over the yard. The outdoor kitchen again is a great addition. We liked the concept of this garden, it made sense and was practical, it was just missing a bit of pop, some larger plants, an outdoor seating area and some garden art would have helped give this garden some wow factor. 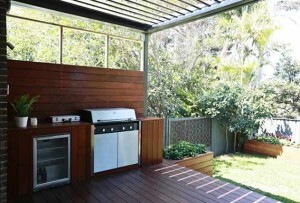 Again an outdoor kitchen, a great addition to a small terrace courtyard garden, its practical and appealing. We also love the small lawn area, a great garden element for small kids, even a small lawn goes a long way. The decking flowing off the indoor space is a great transition from inside to out. Again another practical, user friendly garden. We really liked this one also. All four exterior rooms were beautiful, well finished and added to the house. A great result for the do it yourself renovators. We appreciated that the garden designs were practical, stunning and added to the overall feel of the house. Well done The Block! Online Garden Design – Do it yourself garden designs and DIY guides. Custom made landscape garden plans.